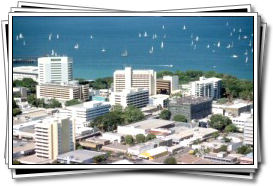 Darwin, the capital of the Northern Territory, has a population of just over 70,000 making it the smallest of Australia's regional capitals. Located on a peninsula in Australia's Top End, Darwin has a tropical climate and is closer to Jakarta than it is to Sydney, and closer to Singapore than it is to Melbourne. There are more than 60 nationalities represented in Darwin, making it one of the most tolerant and harmonious cities in Australia. Surrounded by turquoise seas, palm trees and lush growth, Darwin enjoys a relaxed, holiday atmosphere. Rightfully claiming some of the best restaurants in the country, Darwin also plays host to the best collection of traditional and contemporary Aboriginal art. 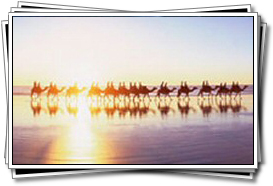 Although Darwin itself is quite small it holds many cultural, natural and wildlife attractions. These include the Darwin Crocodile Farm with its 15,000 crocodiles, the East Point Reserve where the wallabies come out to feed in the late afternoons, the Darwin Botanic Gardens, the Indo-Pacific Marine and Australian Pearling Exhibition which houses an aquarium displaying living coral ecosystems and an array of exotic creatures. Local history & culture is preserved in an exhibition of the pearling industry and the Museum and Art Gallery of the Northern Territory with its collection of Aboriginal art including carvings and bark paintings from Arnhem Land, Bathurst & the Melville islands. Darwin is located in what is known as the Top End, an area famed for its Aboriginal culture, ancient landscapes, giant rivers, sandstone cliffs, dry plains and wetlands. The Top End is home to the oldest collection of rock art in the world, where ancient cliff-face art galleries display Aboriginal spirits and Dreamtime scenes. A couple hours' drive from Darwin is Kakadu National Park, a massive ancient area offering scenic beauty. Slightly closer is the Litchfield National Park with its four waterfalls and surrounding rainforest. Darwin has a tropical climate with dry and wet seasons. During the dry season the days are mild, the nights balmy and cool, and a normal day offers blue skies accompanied by gentle southeast trade winds. During the wet season it is not uncommon to experience monsoon-like rain and intense storms, often with spectacular lightning displays. Cyclone season is from November to April but shelters are available and ample warning is given along with clear instructions. In the dry season from May to September when most days are bright and sunny and the temperature is pleasantly warm rather than hot and humid. Visiting in the wet season will allow you to see a completely different Top End, one that is lush and green (but very sticky).